Majesty Whitaker, Venovia Charon, and Phoenix Clare. Lucy Gellman Photos. Venovia Charon had a trick-or-treating route in mind when she and her goddaughter Phoenix Clare left the house as Halloween pirates. But when a neighbor mentioned a spooky-scary celebration just down the street, Charon thought they’d check it out. A few minutes later, she and Phoenix were deep in a new pile of unmarked treasure and sugar-filled booty. 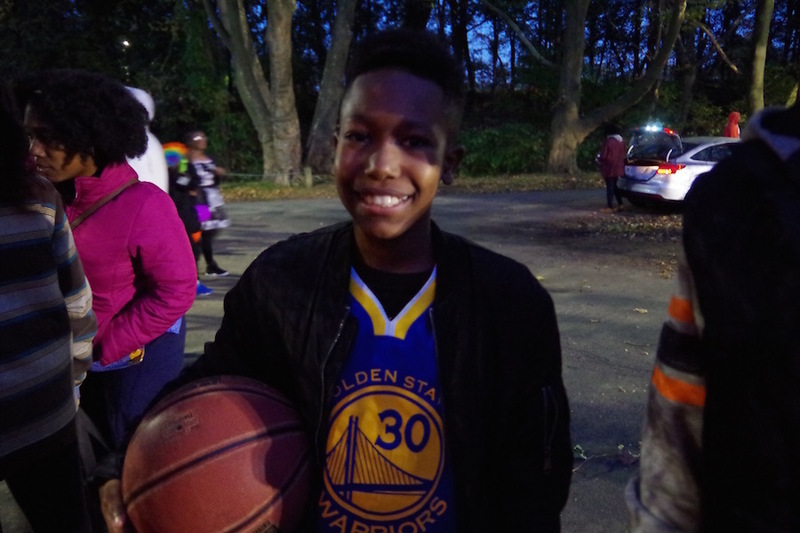 It was New Haven's first city-sponsored “Trunk or Treat,” held Tuesday night in Westville’s Edgewood Park. Organized by the Department of Parks, Recreation and Trees and Department of Youth Services, the event brought in over 250 kids and parents in two hours. Despite dropping temperatures, city representatives were joined by 16 charitable groups, organizations, and individuals who lent their “trunks”—that’s car trunks—to the cause, decorating them with ribbons, crepe paper, streamers, pumpkin decals and lots of candy. 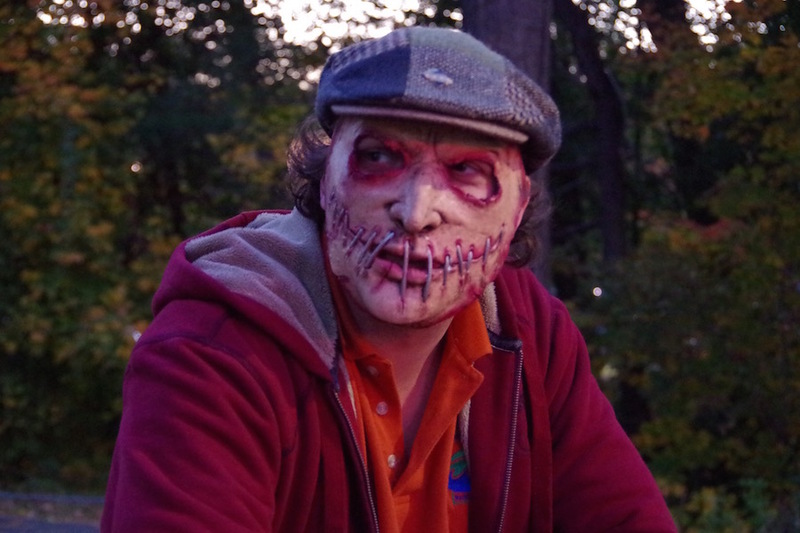 Tanner Conway, New Haven Parks employee turned professional spooky guy. Also called Halloween Tailgating, trunk or treating is a fairly new tradition that has gained popularity in the past few years. It is intended to remedy an old problem: making kids and their parents feel safe on Halloween, no matter where they live or choose to do their trick or treating. Organizations, city officials, and individuals all meet in a location, and fill the trunks of their cars with decorations, music, and candy. In New Haven, the event was born when Youth@Work Program Coordinator Tomi Veale came to Parks and Recreation with an idea. For five years, she had observed a huge Trunk or Treat Program in Bridgeport. She wasn’t sure why New Haven didn’t have something similar. If the city could pull of its signature Morris Cove Halloween Parade and several haunted hayrides and haunted house tours of years past, why not this? Connor “Connie Salami” Gray hands out weenie whistles and stickers. 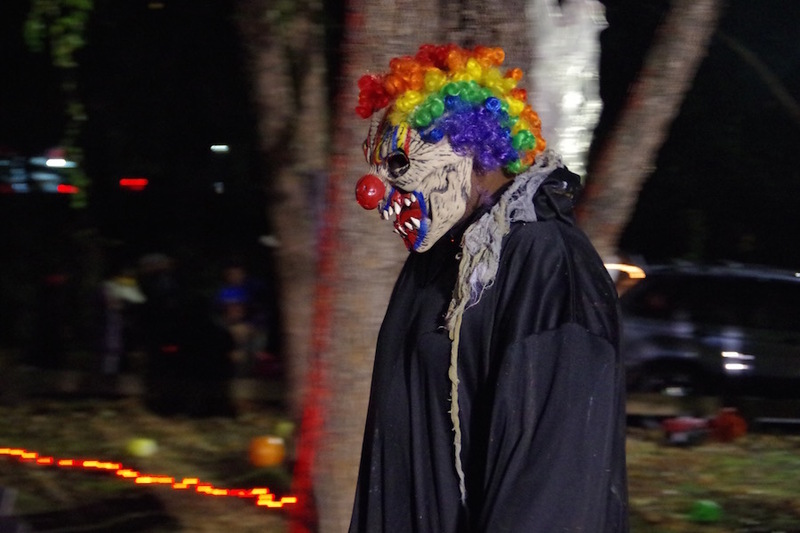 Tuesday, months of planning came to life as Coogan Pavilion and the surrounding area were transformed into a haunted graveyard, scream-inducing outdoor movie theater (Hotel Transylvania was in high demand), and spooktacular dance party with hits from Michael Jackson, Bruno Mars, DJ Casper and others. Just before 6 p.m., kids began to trickle into the park. That trickle turned to a stream by 6:15. Phoenix, dressed in a blue pirate outfit with a three-corned hat and small brown boots, met up with her classmate Majesty Whitaker, who had transformed himself into an Oakland Raider for the evening's festivities. Walking from trunk to trunk accompanied by “Thriller,” Phoenix extended her blue-clad arms, and began to dance like a zombie brought back from the dead. Majesty bobbed between costume-clad bodies in the crowd. Charon walked beside them, taking small steps to avoid stepping on a flood of children. Nearby, Trayvon Ford and Marquel Achu waited on the Oscar Mayer Wienermobile, where Connor “Connie Salami” Gray was dressed as a bottle of ketchup, and handing out weenie whistles and condiment-themed stickers. After masked gatekeeper Tanner Conway had swung the gate open with a creak, it was their first stop. Dressed as Golden State Warriors point guard Steph Curry, Trayvon (pictured above, at center) rolled a basketball over in his hands. He Achu ventured a guess at how many blocks were in a jar. that Gray was guarding. 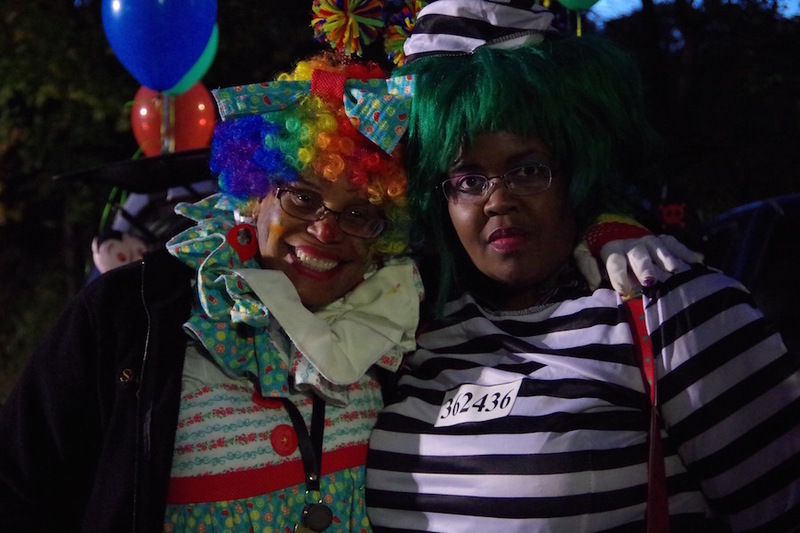 Just a few cars down, friends Regina Wicks and Denise Cox handed out candy from a trunk decorated with the words “Eureka Chapter—Order of the Eastern Star.” Dressed as a friendly clown and Seuss-esque inmate, the two said that they see the event as important community outreach for the order, which meets at the masonic order at 106 Goffe St. "Disclaimer!" Cox shouted. "If your kids are sugar high tonight, it is not our fault!" As she spoke, an adult dressed as the clown from “It” crossed the grassy alcove behind them, sending a few kids hurrying to their parents. Not all, however, were deterred. Traveling in a pack, siblings Noah, Ayden and James Lindsay and their mom Candice made their way to all 17 trunks, from a fog-cloaked New Haven Parks school bus to three cars from University of New Haven’s Alpha Phi Omega service fraternity. Each kid had come up with their own costume — a gumball machine for 6-year-old Noah, masked “Professor of Death” for 9-year-old Ayden, and a “Cereal Killer” for 11-year-old James, whose costume was decorated with small, blood-streaked boxes of Fruit Loops and Apple Jacks affixed to his shirt. When asked what had inspired them to come out, three siblings replied “To get a lot of candy!” in unison. The night before, a gaggle of witches, wizards, minions, and at least one farm animal had come out to a similar trunk or treat at the Winchester Avenue Police Substation, aimed at improving police-community relations while giving kids a safe place to celebrate Halloween. Organized by East Rock/Newhallville District Manager Lt. Renee Dominguez, the event drew between 50 and 70 kids in just an hour. Dominguez said it was similar to one she designed last year, as the top cop for the Westville/West Hills neighborhoods. Outside the substation, kids fished around in four festive squad car trunks for candy, the reserves gone by the end of the night. Bobbing between activities outside and inside the substation, Dominguez provided running commentary on the design, at one point assuring a parent that “I swear, it’s a frog!” of one of the trunks. Inside the substation’s meeting and community room, a whole other party was unfolding. Three tables had been set up for pumpkin decoration, with 70 pumpkins that had been donated by East Haven’s Trolley Museum. At one table, 20-month-old toddler-turned-lamb Skyllar (her grandmother declined to give her last name) tried her hand at a thin purple marker, making a few marks before clapping her hands and looking around the room. Beside her, neighbor Nadine Crimley helped her daughter, first grader Rickelle Byas, glue three foam spiders onto the pumpkin. Rickelle Byas, who is going as a cat this year. “There’s no scary stuff,” chimed in Rickelle. Around the room, there wasn’t. Just a few feet from Rickelle, Arquilla Allen worked on crafts with her son Ardese, who was dressed as Iron Man. She bounced 4-month-old Kyrie, dressed as a Pixar minion, in her arms. He gazed out from below a pair of googly-eyed glasses. Arquilla Allen with son Kyrie. On the job, he spends most of his time patrolling Shelton Avenue, Reed Street, Dixwell and Basset Streets in a car. He said he’s used to seeing lots of neighborhood kids when he’s working. Down the same table, Ya’Kebbie Hall insisted that she was a monster, with bright pink lipstick, pink eyeshadow and mesh over her pink t-shirt. At 8, she said that “I like the scary” of Halloween, and was trying to channel it with a spooky pumpkin. Beside her, Chastity Cloud glued a suite of googly eyes onto her pumpkin. “I feeled happy” about the event, she said. At a fourth table in the back of the room, State Rep. Robyn Porter and Ward 19 Alder Candidate Kim Edwards worked through a jumble of temporary tattoos. They’d come ready for the festivities, Porter with an iridescent red pendant glowing around her neck; Edwards dressed as Minnie Mouse. Having moved on from her pumpkin, Ya’Kebbie held up a temporary tattoo of Elsa, the ice-prone princess from Disney’s Frozen. “Girls in charge, that’s what I’m about,” mused Porter as she helped with tattoo application. As she set the tattoo to transfer, soaking it with water, she asked Ya’Kebbie what she wanted to be when she grew up. “What kind of doctor?” asked Porter. Ya’Kebbie paused for a second. A pediatrician, she answered.